The move: Houston, Texas to Monterey, California. Approximately 1,850 miles. Two people, two cars, two dogs, a three-bedroom house full of stuff. March 2014. The purge: I got rid of quite a bit of stuff before we moved. A month+ down the line, I can say with certainty that I don’t miss (and sometimes don’t even remember) anything that I released. The more I gave away, the lighter I felt. Think about it like this. Everything that you keep is costing you money. 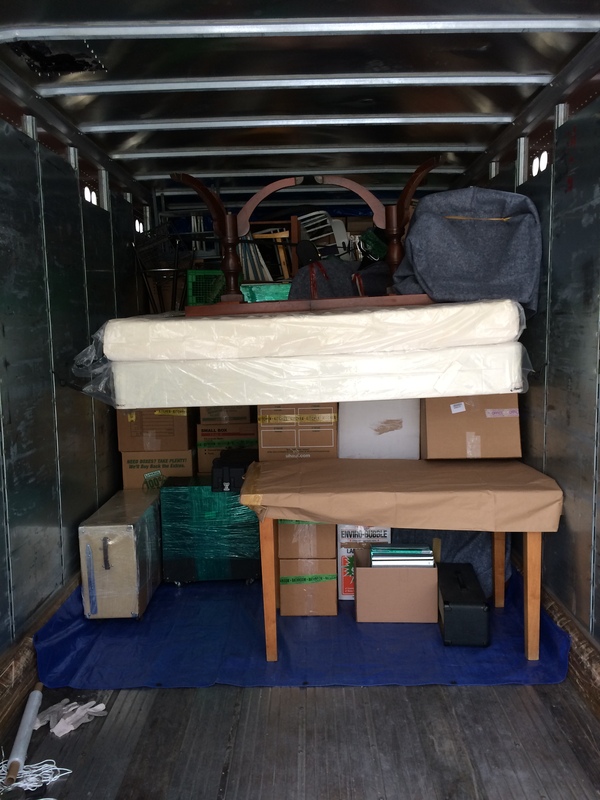 It’s taking up space in a rental truck, and it’s costing time and effort to pack, move from one location to another and unpack. Keep the important stuff–things you love and things you use. Give the rest away, sell it online or donate it to charity. Your back will thank you. The packing: U-Haul is a great resource for moving supplies. They have good prices and fast shipping. White newsprint. Use it for wrapping stuff and filling empty space in your boxes. Boxes are much more stable if they’re packed totally full. We went through three or four boxes of newsprint–not one thing broke. Stretch wrap. Perfect for keeping disassembled furniture (like shelves) together. To protect our couch, we covered the thing in moving blankets and then sealed it up tight with stretch wrap. It arrived in perfect condition. Moving blankets. We should have used more of these. Some of our furniture got scratched up on the way here because we didn’t wrap every piece in a blanket–only the big stuff. That was a mistake. You can also use blankets you already own, but be prepared for them to get damaged or dirty. “Small” boxes. This is the best size to work with. Even full of books or albums, you can still (somewhat) handle the box. Medium boxes are good for lightweight items and things you don’t want crushed (like lamp shades). We probably had about 60 small boxes (lots of books and media) and maybe 15 medium boxes. Bubble wrap. Perfect for keeping electronics safe. Wrap it up, tape it shut and put it in a box with wadded up newsprint for extra protection. Label tape. You could just use colored duct tape, though this tape is a lot cheaper. It helps keep boxes organized when you’re packing, and it makes it much easier when you’re unloading to immediately know which box goes where. Ratchet straps. These are important for securing your load if you’re packing the truck/trailer/pod yourself. We bought the 1″ size, and only one strap broke on the way here. Put clothes, towels and bedding into black garbage bags. They’re good for helping secure your load because you can stuff them between pieces of furniture, boxes and oddly shaped items for a tight fit. Take the drawers out of furniture before moving it. When you’re on the truck, put the drawers back in and fill them with lightweight stuff (pillows, stuffed animals–things that aren’t heavy enough to damage the drawers on the drive but do take up space). Try to put everything except furniture into boxes. It makes packing the truck much easier and helps protect your items. Put important documents (birth certificates, passports, car titles, pet vaccinations, etc.) into a file folder that you keep with you. Don’t leave it on the truck. Use every bit of space. Pack things inside luggage, coolers, your trash can, laundry basket. Tape screws and cords to the items they go with (or place in a baggie and tape that). If there’s something jinky about how things are set up, write it on a piece of paper and include it with the screws/cords. You think you’ll remember–you won’t. Just write it down. Pack TVs and computers in the box they came in, if possible. The mover: We used ABF U-Pack. It’s a freight shipping company that will ship your stuff in pods or trailers that you load. We used a trailer. 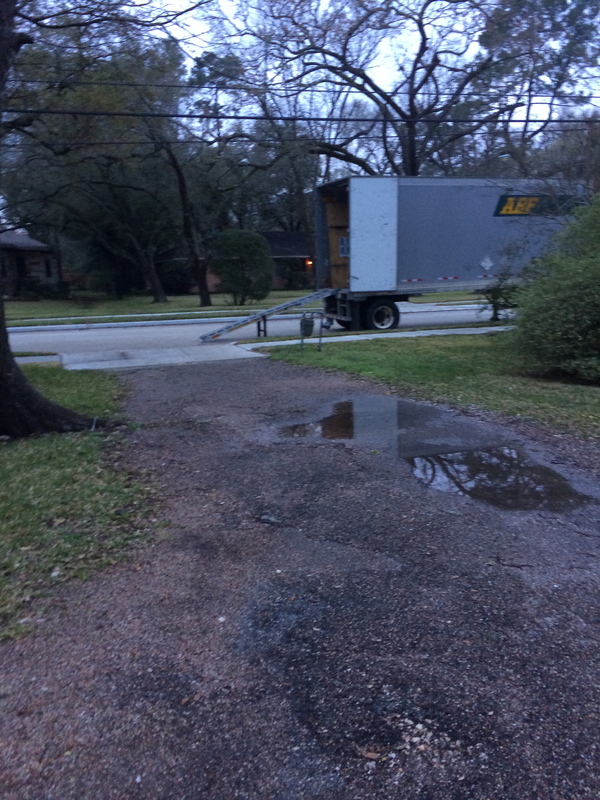 Here it is parked on our street in Houston. The U-Pack trailer is about half the length of a typical semi-trailer. 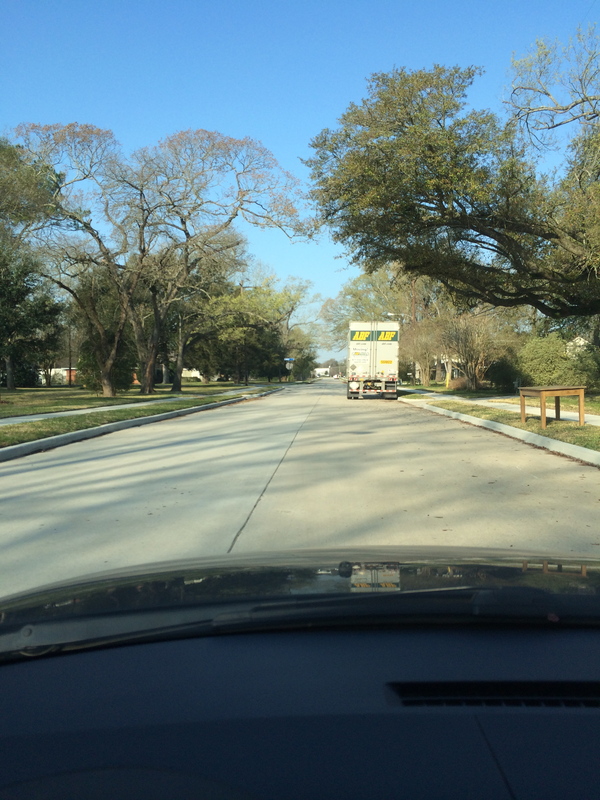 We saw a few ABF trucks on the road when we drove here, and they haul two trailers at a time. Using their various space estimators, I kept guessing we’d need around 16 feet of the trailer’s 28 feet. When I called to reserve a trailer, the guy quoted me 17 feet. The good thing about U-Pack is you pay for the space you use, not what’s quoted. Much better than the places that charge by the pound. Our quote came in at $4,510 for 17 feet of trailer space (+/- $143 for each foot we came in under or over) and $375 for up to a month of storage on the destination end. We ended up fitting our stuff into 15 feet, so we saved a little off the estimate. Then we lost that on the storage fee because it took over a week to find a house to rent. You need 14 feet of vertical clearance if you want the trailer parked in your driveway. Sadly for us, we only had about 12.5 feet of clearance because of electrical wires. The trailer had to stay on the street. They let you have the trailer for three business days on each end. I called ABF dispatch the second evening to let them know we didn’t need the third day. They picked up the trailer the next afternoon. We left Houston the following morning (after sleeping on a blow-up bed in an empty house) and headed west. Our stuff beat us to New Mexico and was already in Tucumcari by the time we got to Las Cruces that night. And it was in San Jose before we’d made it to Monterey. They give you a two-day grace period to accept delivery once it’s arrived at the storage destination. After that, you have to pay a monthly storage fee, no matter how many days it sits there. Something I really like about ABF is that your stuff is the only household that will be on your trailer, and it’s never off-loaded. The rest of the space is taken up with freight that gets dropped along the way. If your trailer goes into storage, your stuff is the only thing that’s in there. I found the ABF people easy to work with, friendly and responsive and consider our exprience with the company to be five stars. The load in: When the guy dropped our trailer off, he said “high and tight” was what we needed to keep in mind as we loaded the trailer. Since these are freight trailers, they provide a much more rough ride than a truck you’d rent or a full-service moving company would provide. It’s important to pack everything as tightly as possible, floor to ceiling, to reduce movement. We were “lucky” it was raining when the trailer was dropped off because it was easy to check for leaks. Though I’d read horror stories about nasty trailers with holes in the ceiling, our trailer was clean and in very good condition. We put tarps on the floor to try to protect our stuff but didn’t bother using the tarp we’d attached to the top. 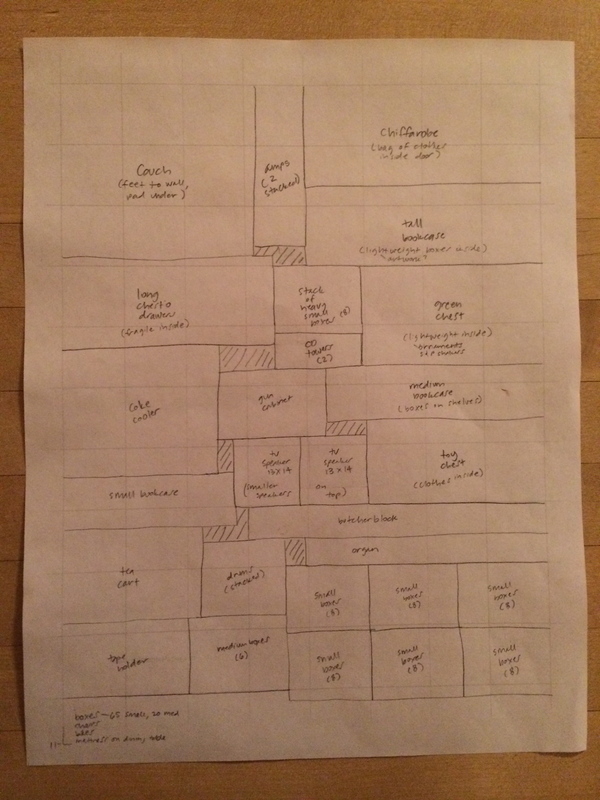 I measured all of our furniture and marked up a sheet of graph paper with a sketch of how I thought things might go. We had to adapt as we went along, but the sketched out plan gave us a good starting point. Heavy stuff at the front, fragile stuff on top. The easiest ride is toward the front of the trailer, so you don’t want to load your box of crystal last. 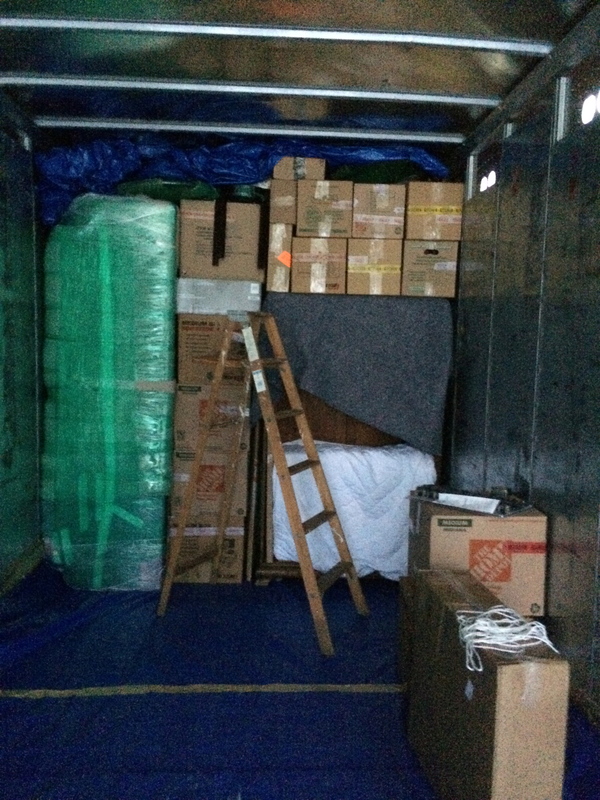 I watched an incredibly useful tutorial on building tiers in a moving truck. Wish I could share it with you, but it’s since been removed from YouTube–sadly, I can’t find it anywhere else. Just know that you want to load the trailer one section at a time, typically two-feet deep, and run ratchet straps across your load to stabilize. Then build the next tier. If you have a Tempurpedic mattress, you can’t move it on its side like you would a normal, less high-maintenance mattress. We weren’t sure how we were going to move our mattress (couldn’t find any suggestions online) until a smart person who’d stopped by suggested we run ratchet straps horizontally across the trailer and hang the mattress. It worked like a charm. The road trip: It would have cost $1,000 or more to ship one of our cars to California, so we both drove. My friends made fun of me when I mentioned I’d bought walkie-talkies for the trip. I wasn’t sure if they’d be handy or not. They were. Not only for bathroom breaks (for us or the dogs) but also to share the drive. We were able to talk about the scenery, make jokes along the way and keep each other awake and engaged across long stretches of desert. Here are the ones we used. The little dog rode with me. To give her a good vantage point (and hopfully avoid any potential car sickness), I got her a raised dog seat. She spent most of her time sleeping (just like at home), but seemed to enjoy the seat. And didn’t mind being buckled in the entire time. 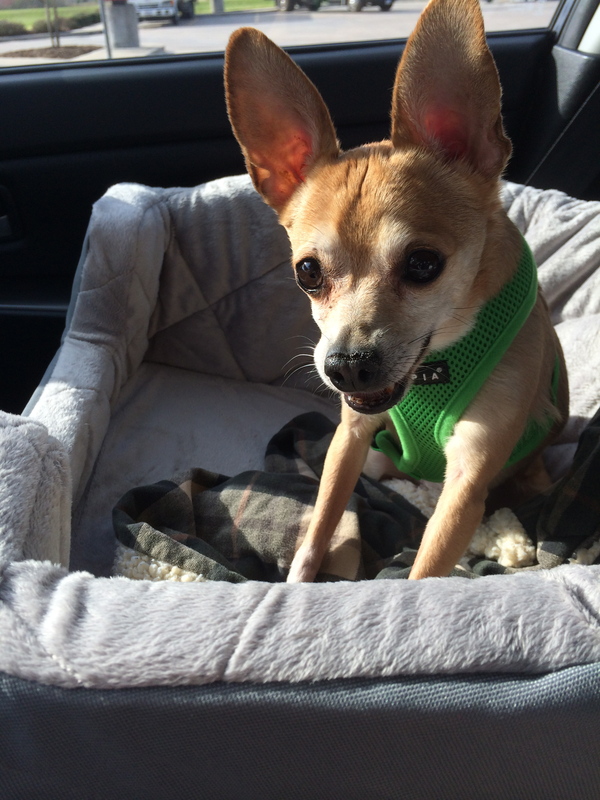 If you’re traveling with dogs, make your hotel reservations before you leave home. There are lots of places that don’t allow pets, and plenty that do allow pets but are really gross. We had a good experience with a Drury Inn and then a Best Western. Your mileage may vary. The wrap up: That’s about it. If you have tips you’d like to share, feel free to post in the comments. Good luck with your move. You have no idea how helpful and pertinent that post was. I am moving back to Illinois this summer. I doubt I’ll be as DIY as you and James, but good tips nonetheless! That’s exciting news, Mary! And a big move. Good luck. Very good post, especially about the tempurpedic! I am going to make a platform using the E-track rails in the trailer walls…they sell holders for 2×4 lumber that snap into the e-track.